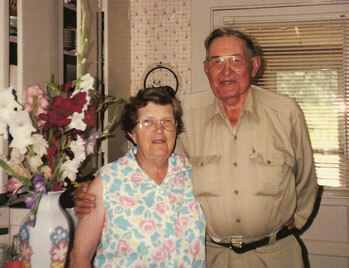 Back in 1948 Christine's parents, Herbert and Natalie Colburn, bought the land that is known today as Berry Best Farm. It has been a working family farm since then and we've raised everything from chickens, hay, and Standardbred race horses to what we are best known for today--blueberries and peaches. After returning from service in WWII in 1948, my father Herbert "Herb" Colburn purchased the land off Center Road in Lebanon, Maine. With the help of Herb's brother Bob and Bob's portable sawmill, the land was cleared and the family home was built. Herb and my mother Natalie (a self-proclaimed "city girl") worked hard to develop the 75 acres of land into a productive farm. In 1950, they built a poultry barn and began raising laying hens. They had 6,000 hens and continued raising chickens up through the early 1960s. 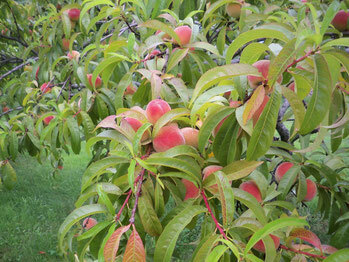 Around this time they discovered that the southwest-facing slope of the farm was a good site for growing peaches, and that was how the first peach orchard at the farm was established. At this time they appropriately called the farm "Hen Fruit Farm." Potatoes were one of the first crops Herb tried to grow in one of his newly cleared fields, but he found that raising potatoes was too much work. The next year, he sowed grass instead, which was much easier. 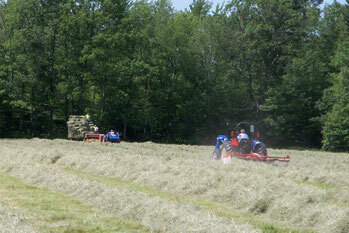 That same field has been a hay field ever since and today provides us with ample hay for the farm's horses. Herb noticed that wild highbush blueberries grew readily on his cutover woodlot, and he began planting some of the first cultivated blueberry varieties available from New Jersey sources. Five varieties were established in the late 1950s, all of which are still productive. Some of the beautiful Berry Best Farm peaches (2014). Today we have approximately 2,500 highbush blueberry bushes in 11 different varieties, growing on about five acres of farmland. By 1956, Herb could no longer stay away from his love of horses. An experienced horseman, he was a former member of the U.S. Cavalry. He and Natalie started breeding, training and racing Standardbred trotters and pacers. They built a 1/3 mile jog track around part of the farm. You can see the outline of the track today in the aerial photo above. The poultry barn was converted to a horse barn and that was when the farm became known as the "Colden Stock Farm." For the next two decades our family raced trotting and pacing horses throughout New England. At college in Connecticut in the mid-1960s, I met my husband John Bozak. By 1967 we had two small boys, John and Brian, and we had been living in Oregon where John was working as a forester. It was then that we decided to move back to our New England roots and we purchased a home in Strafford, New Hampshire. Our family--that now also included daughter Jennifer--became more active in helping with the farm, especially as Herb became physically unable to do so. 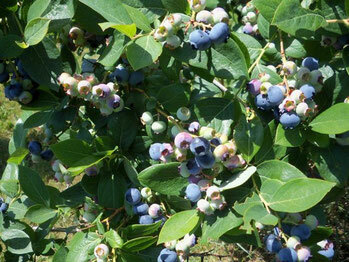 It was at this time that more blueberries were planted and more varieties added. We acquired our farm from Christine's parents, Herb and Natalie, in the late 1980s and built our home on the hill in 1996. 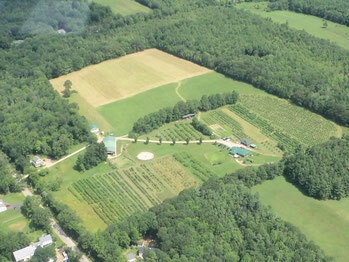 Now we call it the "Berry Best Farm," as we continue to grow berries and fruit. Herb and Natalie are no longer with us, but we hope to carry on their love of the farm and will protect it for future generations. 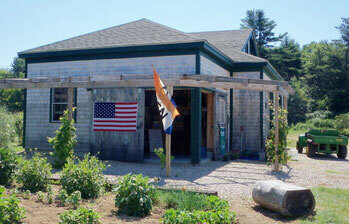 In 2010 Berry Best Farm joined the Three Rivers Land Trust (3RLT). The loss of viable farmland in York County is becoming an increasing concern and we knew it was time to put actions in place. With the help of 3RLT volunteers an agreement was drawn up which protects our farm from development forever so that it can be enjoyed by future generations.